“This was surprisingly good for something that was probably a staple for medieval peasants.” So says the BF. I needed some way to use up more CSA veggies. We received yet more root vegetables, and really, I was running out of ideas. I dug up my Cooking in the Moment cookbook, Andrea Reusing’s excellent book of recipes focused on cooking seasonally. The recipes are divided into spring, summer, fall, and winter, and considering I have a winter CSA, I thought I might have some luck there. 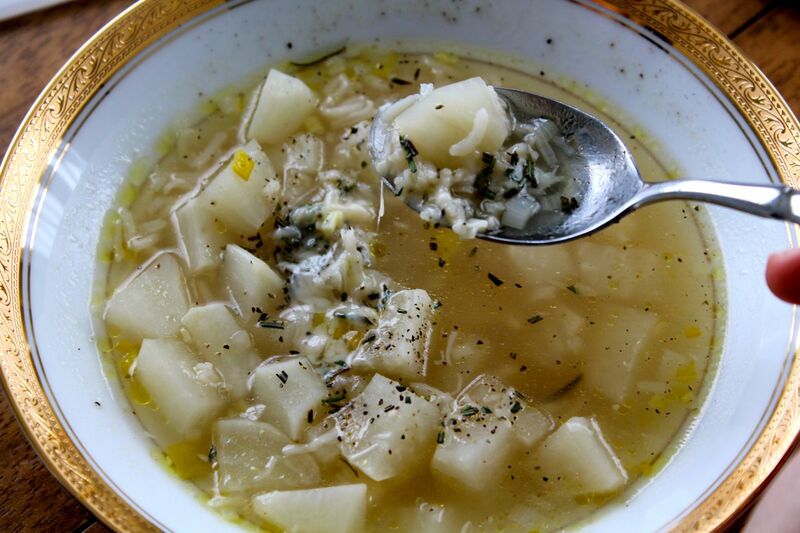 I found her recipe for Turnip Soup with Rosemary and Black Pepper. I adapted it a bit and gave it a shot. Considering I didn’t think I liked turnips, I thought this was very delicious. And as the BF says, as turnips are often considered a somewhat lowly vegetable, it really turned out great. I used my own homemade vegetable stock that I had also made with rosemary, so that was really the strongest prevailing flavor, which I love. I topped mine with black pepper, parmesan, and rosemary. If you want to go vegan, leave the parmesan off, no problem. If you want a slightly different flavor, use chicken stock instead of vegetable stock. Add the olive oil to a heavy stockpot and warm over medium heat. Saute the onion and garlic until slightly brown, about 5 minutes. Season with salt and pepper. Pour in the wine and stock, and bring to a simmer. Season with more salt, if necessary. 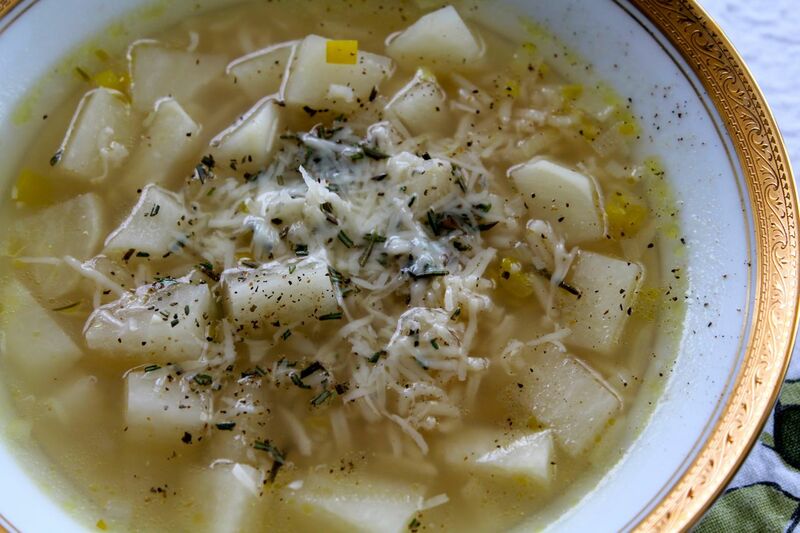 Discard the rosemary branches, and serve the soup into bowls. 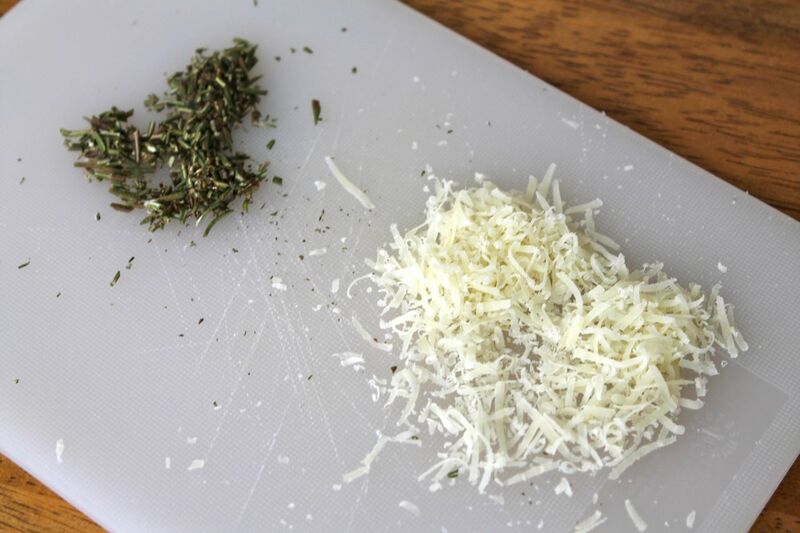 Top with grated parmesan, fresh-ground black pepper, and chopped rosemary.